Oil on panel, 33 x 36,5 cm. Jeronymus van Diest continued in the style that characterised his father Willem van Diest’s grey-toned and monochrome marine paintings. With his light brush strokes and grey silver tones, the artist’s works also became part of a prevailing trend within the marine painting genre in the mid-1600s, where the tonal colour palette was used to emphasise the atmospheric mood. 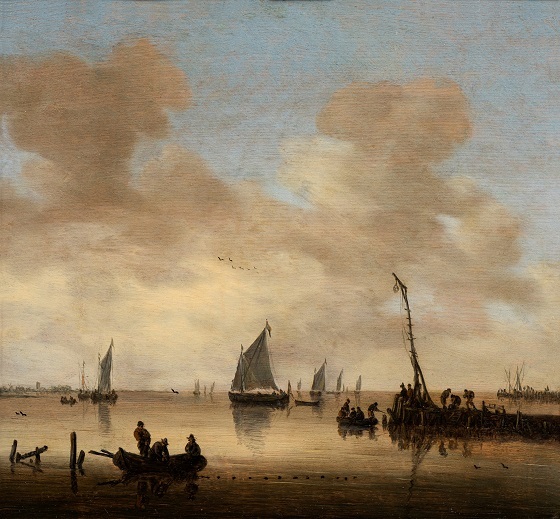 In this marine painting, Dutch sailing ships have sailed out on a dead-calm lake to catch fish. A small boat is heading towards the fishing vessels. The light fog and the calm weather erases the visible border between the sky and water, while the grey and brown shades of colour lend a quiet and harmonious appearance to the scene. The artist has also incorporated elements from genre painting by depicting the daily life and work of Dutch fishermen.